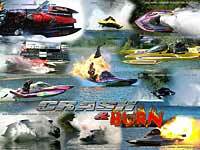 This poster features some of the most spectacular crash and burn photos ever shot by Dragboats.com. The poster includes Tim Stokes Widowmaker crash, Hannes Wernharts Showtime, Rick Davis Dressed in Drag, Mike Gildays Witchcraft, Jon Wrights Tinker Toy, Terry Wheelers California Sound, Ron Braaksmas Madness, Ron McLellans Liquid Quiker II, Charlie Wilkies Black Widow, Dwayne Pattons incredible Wildside engine explosion, and Greg Tedescos Loose Cannon fireball. Definately a must for the Drag Boat Junky! $11.95/ea - Save $2/ea when you order 2 or more!